Swing over cross slide 8 5/8"
Spindle hole dia. 1 1/2"
Width of bed 8 1/8"
This 14" Swing BIRMINGHAM YCL-1440 Lathe is an all geared headstock 14" x 40" metal cutting lathe and will make a great new addition to your machine shop floor. Some of the many features included on this Birmingham 14" x 40" lathe are a one piece cast Iron base, a 3 HP main motor and a 1 1/2" spindle bore . It is equipped with inch and metric threading and requires no change gears for most thread cutting applications. The bed is made of a fine grain high tensile strength cast iron and the gears, shafts, bedways and spindle are all precision hardened & ground. The spindle on the Birmingham YCL-1440 Lathe is supported at three points by precision bearings and will assure your machinist of a good, solid and accurite cut for many years to come . Available with either 220 Volt Single phase or 220 Volt 3 Phase pre-wired electrics this Birmingham YCL-1440 Lathe is built to be a long time performer . Additional features and equipment include 3 and 4-Jaw Chucks, face plate, steady rest, follow rest, removable gap bed, 4-Way Tool Post, thread chasing dial, dead centers, reducing sleeve, full length splash guard, chip tray, foot brake, worklight and coolant system . Taper attachment is optional but installation is free when ordered at time of purchase. 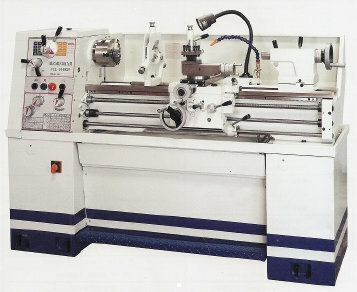 Birmingham Lathes - The Machinist Choice ! 6" 3-Jaw Chuck, 8" 4-Jaw Chuck, 10" Face Plate, 3 3/4" Steady Rest, Follow Rest, Removable Gap Bed, 4-Way Tool Post, Stand, Thread Chasing Dial, Dead Centers, Reducing Sleeve, Full Length Splash Guard, Chip Tray, Foot Brake, Worklight, Coolant System.